More than 150,000 Floridians had their voting rights restored during former Gov. Charlie Crist's four years in office. In the seven years since then, current Gov. Rick Scott has approved restoring voting rights to just over 3,000 people. The panel congratulated Calvarese on turning her life around and gave her back the right to vote. Most of the 100 others making the same request that day were not as lucky. Across the U.S., most states restore voting rights to felons after they've completed their sentences. Some wait for probation and parole to be complete. In recent years, many states have updated and streamlined the process. Florida, however, has gone in the other direction. When Gov. Rick Scott took office seven years ago, he rolled back reforms put in place by his predecessor, Charlie Crist. More than 150,000 Floridians had their voting rights restored during Crist's four years in office. In the seven years since then, Rick Scott has approved restoring voting rights to just over 3,000 people. In Florida, more than 10 percent of the adult population is prohibited from voting because they've had felony convictions. Under a law that dates back to the Reconstruction era, Florida bars felons from voting, unless officials approve a request to have those rights restored. That means nearly 1.5 million people in Florida can't vote, even though their sentences are complete. At a hearing in 2016, Scott tried to explain to one man why he was denying his request to have his rights restored. "Clemency is — there's no standard," Scott said. "We can do whatever we want. But it's ... tied to remorse. And ... understanding that we all want to live in a law-abiding society." Jon Sherman, with the Fair Elections Legal Network, says that's the problem with Florida's system. "There's no rule, no standard, no criteria governing their decision-making," he said. "Sometimes, the governor simply says, 'I don't feel comfortable at this point.'" Sherman believes the inconsistent way in which Florida restores voting rights violates the U.S. Constitution. He represents a group of former felons that's suing the state. "A lot of people have seen how unfair and arbitrary the process is, how delayed," Sherman said. "I mean, we've met people who are waiting for up to 10 years for a hearing on their application. And they see that and they decide, 'You know, it's not worth it to even apply.'" One of those suing Florida is Yraida Guanipa. She served 11 years on a drug trafficking conviction before being released in 2007. Since then, she's gone back to college, earned a bachelor's and a master's degree, and started a business in Miami. Her probation ended in 2012, but Florida's law requires her to wait an additional seven years before applying to have her rights restored. "The seven years is not up until next year," Guanipa said. "And after that, I have to get into the line of the backlog, of maybe 10 years. I probably would be dead." Part of the reason Florida withholds the right to vote from felons, Guanipa says, is political. She believes it's aimed at suppressing the vote in minority communities. "It's not only punishing me," she says, "but it punishes my family and my community because it's blocking us [from having] a voice." In Florida, more than 20 percent of otherwise eligible African-American adults are unable to vote because of the law. Earlier this year, a federal judge said Florida's process for clemency and restoring voting rights was unconstitutional. The state appealed and arguments in the case are scheduled in a few weeks. But before there's a final decision on that, Florida voters will weigh in. Another group that has been working to restore voting rights for felons, the Florida Rights Restoration Coalition, gathered more than a million signatures for a constitutional amendment that will be on the November ballot. It would restore voting eligibility to most felons once they'd completed their sentences. "This is an issue that transcends rural-urban-suburban divide. It transcends the partisan divide," said Neil Volz, with the coalition. "And it really is something that impacts all communities and all walks of life." Many believe the referendum may offer the best chance of overturning Florida's ban on felon voting. Recent polls show it's supported by more than two-thirds of state voters. Next, we have an update on voting rights for people who've been convicted of crimes. In the state of Florida, more than 10 percent of the adults in the state - more than 10 percent of all adults - are prohibited from voting because they've had felony convictions. This is because of a 150-year-old law. It bars felons from voting unless officials approve a request to have their rights restored, which means nearly 1.5 million people in Florida cannot vote even though their sentences are complete. NPR's Greg Allen reports on efforts in Florida to change that law, one at the polls and one in the courts. 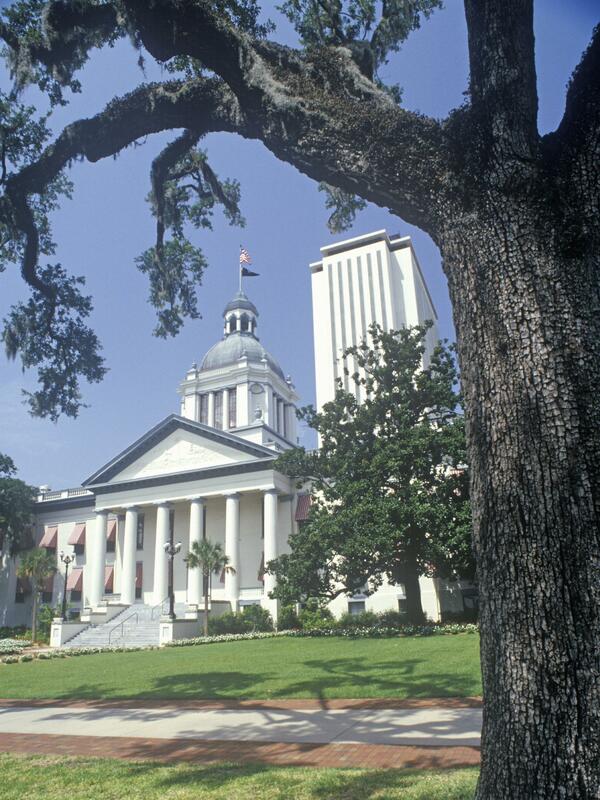 GREG ALLEN, BYLINE: At the Capitol in Tallahassee, this scene plays out four times a year. RICK SCOTT: The executive clemency board meeting is now called to order. ALLEN: Dozens of former felons, people whose sentences and probations are complete, stand before the governor and other Cabinet members to ask for clemency and the restoration of their right to vote. After waiting for years, Joanne Calvarese made her case to the clemency board in June. JOANNE CALVARESE: I feel that I've paid my consequences. I know I don't deserve your mercy, but I beg you for it. ALLEN: The panel gave Calvarese back the right to vote. Most of the 100 others making the same request that day were not as lucky. Across the U.S., most states restore voting rights to felons after they've completed their sentences. Some wait for probation and parole to be complete. In recent years, many states have updated and streamlined the process. Florida, however, has gone in the other direction. When Governor Rick Scott took office seven years ago, he rolled back reforms put in place by his predecessor Charlie Crist. More than 150,000 Floridians had their voting rights restored during Crist's four years in office. In the seven years since then, Rick Scott has approved restoring voting rights to just over 3,000 people. At a hearing in 2016, Scott tried to explain to one man why he was denying his request to have his rights restored. SCOTT: Clemency is - there's no standard. We can do whatever we want. But it's tied to what we said in the beginning. It's tied to remorse, and it's tied to understanding that we all want to live in a law-abiding society. JON SHERMAN: There's no rule, no standard, no criteria governing their decision-making. Sometimes the governor simply says, I don't feel comfortable at this point. ALLEN: Jon Sherman believes the arbitrary and inconsistent way in which Florida restores voting rights violates the U.S. Constitution. He's with the Fair Elections Legal Network and represents a group of former felons suing the state. SHERMAN: A lot of people have seen how unfair and arbitrary the process is, how delayed - I mean, we've met people who are waiting for up to 10 years for a hearing on their application. And they see that, and they decide, you know, it's not worth it to even apply. ALLEN: One of those suing Florida is Yraida Guanipa. She served 11 years on a drug trafficking conviction before being released in 2007. Since then, she's gone back to college, earned a B.A. and a masters and started a business in Miami. Her probation ended in 2012. But Guanipa says Florida's law requires her to wait an additional seven years before applying to have her rights restored. YRAIDA GUANIPA: The seven years is not up until next year. And after that, I have to get into the line of the backlog of maybe 10 years. So I probably will be dead. ALLEN: Part of the reason Florida withholds the right to vote from felons, Guanipa says, is political. She believes it's aimed at suppressing the vote in minority communities. GUANIPA: It's not only punishing me, but it punishes my family and my community because it is blocking us to have a voice. ALLEN: In Florida, more than 20 percent of eligible African-American adults are unable to vote because of the law. Earlier this year, a federal judge said Florida's process for clemency and restoring voting rights was unconstitutional. The state appealed, and arguments in the case are scheduled in a few weeks. But before there's a final decision on that, Florida voters will weigh in. A referendum that would restore voting eligibility to most felons will be on the November ballot. (SOUNDBITE OF PHILANTHROPE'S "MELLOWMONDAYS") Transcript provided by NPR, Copyright NPR.